If you have not tried Windows 2012 server yet – you should give it a spin. Yes, it is missing the start menu – but the performance blows 2008 server out of the water. I don’t have any specifics to back it up, but just the boot time and general overall system responsiveness will really impress. One of the sad things about 2012 is they have removed RDP Shadowing. 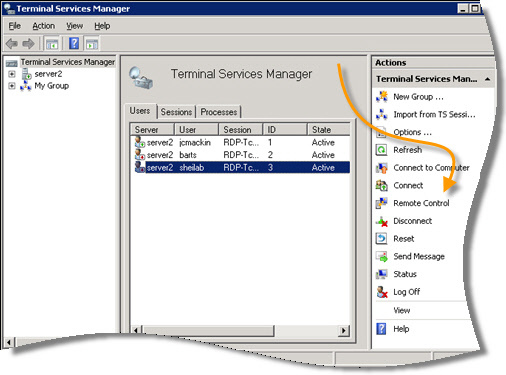 RDP shadowing is used to ‘jump’ into a terminal service / RDP session that is active…and be able to move the mouse, type on the keyboard and share that RDP session with its user. The lack of shadowing is quite painful when most of your users login to a terminal server to do their work. Luckily we have the answer – IntelliAdmin Remote Control. 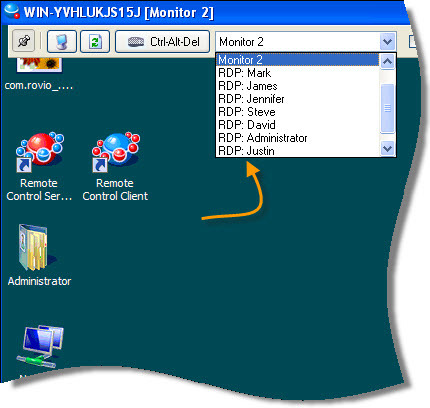 Our remote control software can easily shadow an RDP session – Even on older systems that run XP, or 2003. Just install the agent on the computer you want to control, and then connect to it with our viewer. Within a few seconds the system will allow you to “jump” into their session. You can simply observe, or if needed you can move their mouse around and type on the keyboard – just as if you were the one with Remote Desktop open. We have 5 terminal servers – would this require a license per server in the farm or 1 for each person administrator? Excellent steve. We were just starting to look for something on 2012. Can’t understand MS on this issue. This would just be one license per administrator. I’m testing your IntelliAdmin Remote Control software on a RDS 2012 setup. When i try to connect to one of the log on users, it write to me in the middle of the screen: The Session is no longer active. This happens when the remote user minimizes their RDP client window. Microsoft disables the video drivers during this time to reduce bandwidth….so our software will show that the session is not active. What we really want is to use RDP shadowing for presentations within a classroom. There really aren’t any good software solutions at present for sharing desktop contents from an instructor’s machine onto student machines. All the ones out there assume it’s via the internet. I could easily imagine that I would RDP into a VM on my own machine and run the class from there. I could then have the student machines shadow my RDP session (without any need for remote control ie: output only). If so, I think you’d be surprised how popular a product that could be.